Duck noodle soup – At my favourite place to eat noodle soup in Bangkok. A rich, dark broth, chopped Chinese celery, crisp shallots and garlic – and slices of tender roast duck. My mouth is watering thinking about it. It doesn’t even need the condiments that come, but adding them makes an amazing taste explosion of sour, salty, spicy and sweet. Like the BKKRS I add a good spoon of sugar – at a no name restaurant on the corner of Samsen soi 5, Bangkok, Thailand. Porntip Restaurant, Ubon Ratchathanii, Thailand – Papaya salad again…. My obsession with papaya salad continues at Porntip resataurant in Ubon, North East Thailand – in the Isaan region where some of the best Thai food comes from. Porntip I love you….But why do you have to be in the middle of nowhere? Red sticky rice steamed in bamboo. Like if the cheese stick people made rice pudding – in Chiang Rai bus station. Miniature pig balls – their words not mine, shredded chicken and wide rice noodles in Tom yum broth. Topped with pork crackling, fried fish sausage, and won ton crackers. 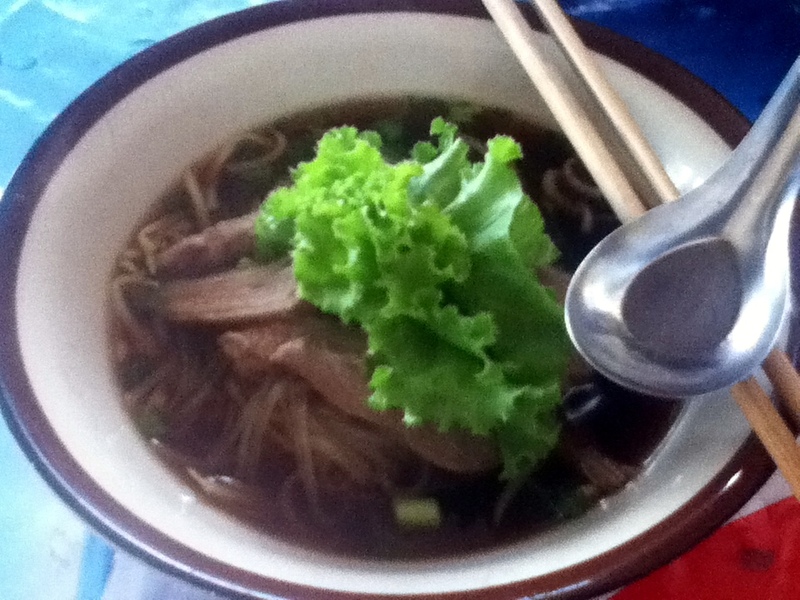 I kid you not when I say this is one of the best noodles soups to have ever passed my lips – in Chiang Rai. Thai style doughnuts, and warm sweet soy milk. Like Thai churros. Fried radish cake with egg and bean sprouts. Awesome starchy snack. Undoubtedly the world capital for street food. You could literally spend weeks trapsing around Bangkok trying different dishes and never have the same thing twice. The thing is,in practice it’s too easy to find something you really like and eat it all the time, especially if you pass the same way often – think duck noodle soup, I am. So for the last couple of times we pass through Bangkok this trip I’ve decided to stick to the without eating the same dish twice. The Idea Comes from Richard Barrow on his fantastic Thai Food Blog – Although I’m not able to stay in Bangkok eating food for 30 day, as much as I’d love to, everytime I’m there for the next few weeks I’ll keep it going. 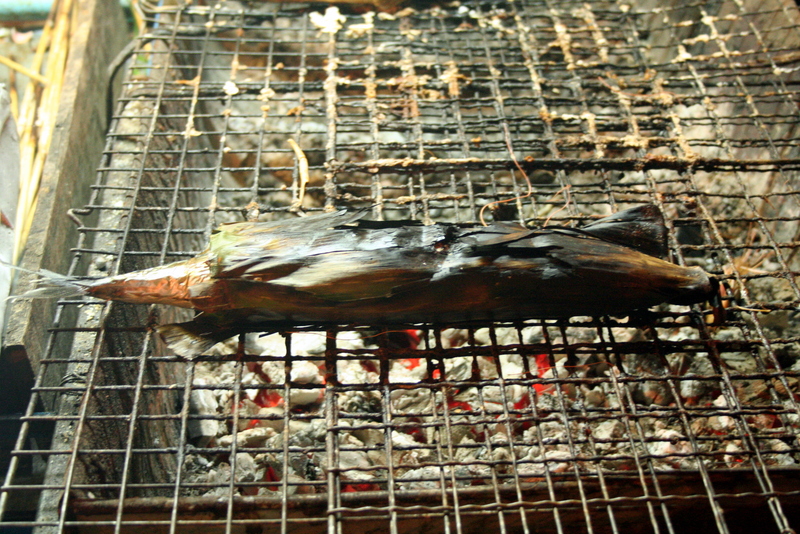 Grilled mackerel wrapped in banana leaf – We got this on a stall on Samsen Soi 6 where there are a few places doing grilled fish. I love the way the Thais cover their fish in bucket loads of salt before it goes on the grill – the seasoning penetrates right through and gives the flesh a slightly cured flavour. 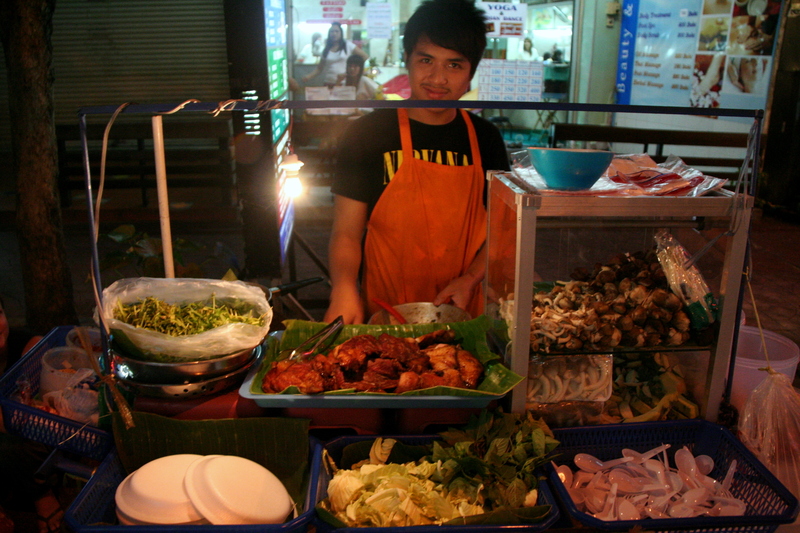 Spicy Beef Salad – This young gentleman made me an unbelieveable Thai beef salad. It had an incredible amount of fresh chilli and the guy working there was even worried I might not be able to eat it. Obviously I proved them wrong, but it was the hottest thing I’ve ever enjoyed. Lots of plain cabbage and Thai basil help to cool though. 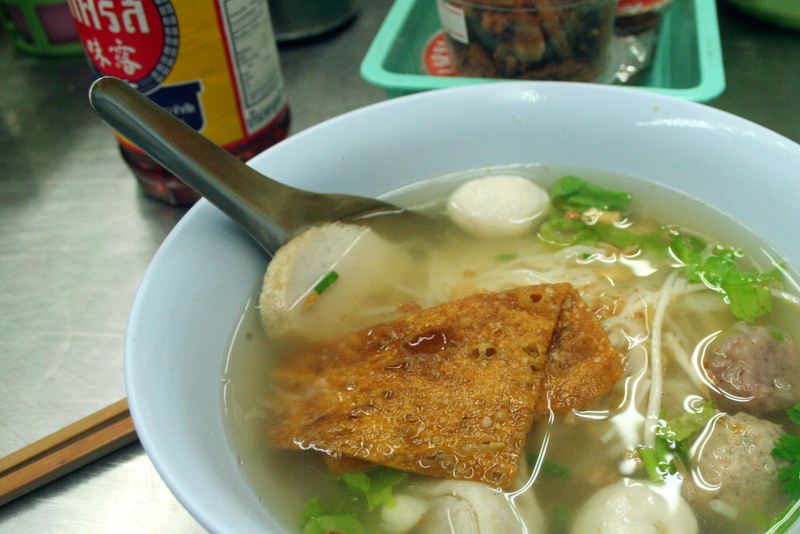 Mixed Noodle Soup – My personal favourite dish in the morning has got to be a bowl of noodle soup. This place we went to on Phra Sumen was jam packed with older women munching away on steaming bowls of soup – a sure sign of a good meal I’m told. The soup had fish sausage,fish balls, wontons, pork balls and was topped off by this huge corn cracker on top. Cornflakes with soup mmm. 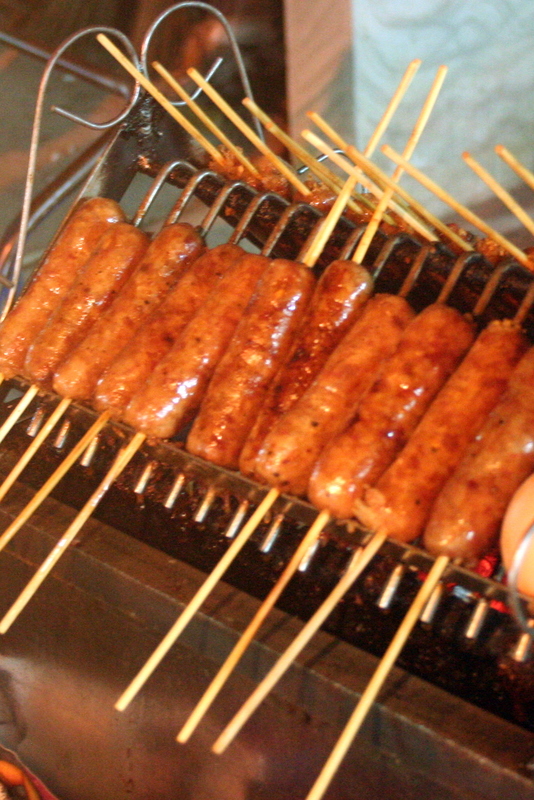 Pork and Vermicelli Kebabs – I’m gonna struggle passing one of the stalls selling these guys. 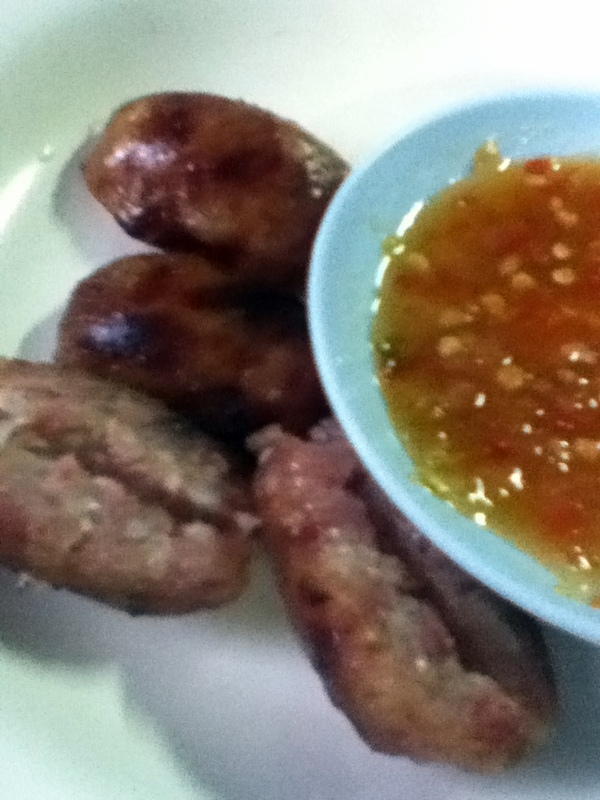 The meat is a bit fermented giving it a bit of a funky taste so not everybody’s cup of tea. 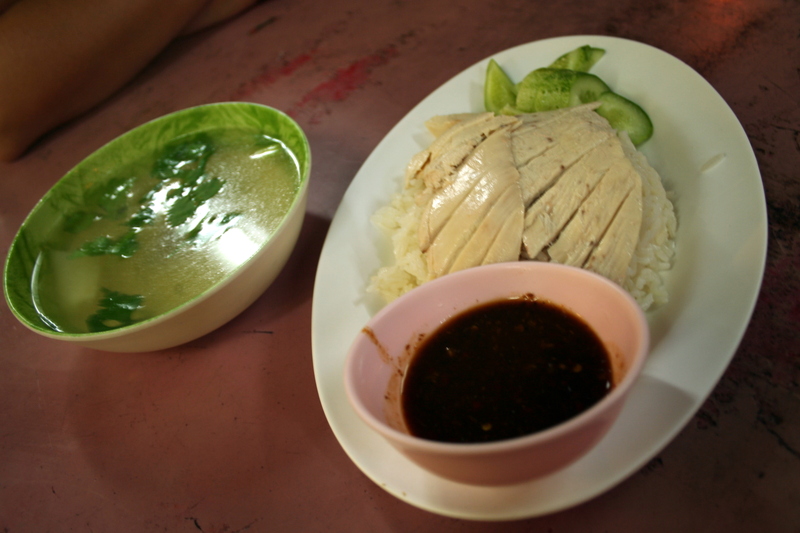 Chicken Rice – Actually a Chinese dish, but given the thai onceover with a super spicy and fresh dip for the chicken. But apart from that its just a plate of perfectly poached chicken over rice, some of the broth with chinese celery,and a few chunks of cucumber. Sometimes the simplest things are the best. 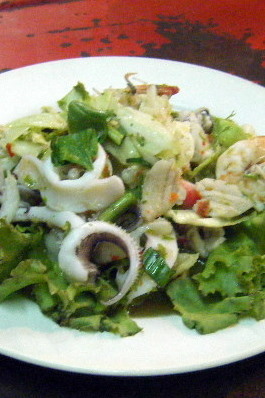 Thai stlye seafood Salad – More salad, More chilli. It always seems that when a dish has lots of cooling leaves and herbs the thais use this as an excuse to add a shitload of chilli. This is just freshly cooked seafood, leaves, some thai basil and a sweet/sour/spicy/salty dressing. More simple great food. And where else can you get fresh fish for 60p? Papaya Salad – Another Salad, why not? It’s been absoloutely roasting in Bangkok this week. All the fresh salads have been a godsend. 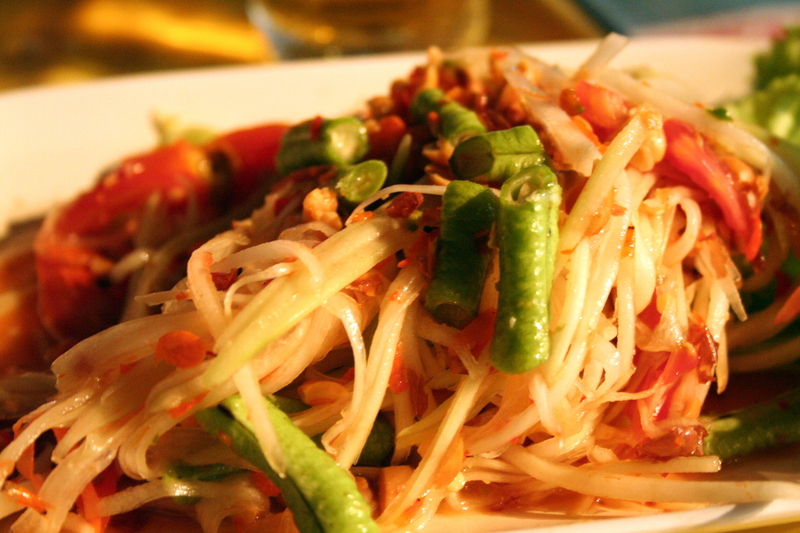 This is a classic northern thai dish of green papaya strips, long beans, peanuts, tomato. It’s dressed with fish sauce, lime and lots of chill – of course- then its pounded up in a huge mortar to bruise it a little and mix it up.